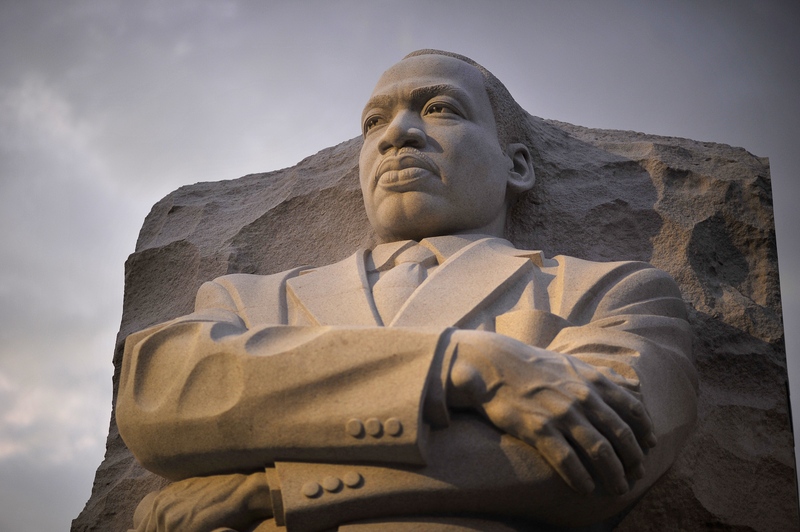 January 15 of this year marked what would have been Martin Luther King Jr.'s 87th birthday, and while you know the basic history behind Martin Luther King Jr. Day, there are some Martin Luther King Day facts that will likely surprise you. Martin Luther King Jr. was only 39 years old when he was fatally shot, but his unwavering drive in the Civil Rights Movement will never stop inspiring us to fight for equality. And there is a lot about this great American leader you might not know — which makes sense, because despite the short amount of time MLK walked this Earth, he was quite a fascinating fellow. And because he was such a heroic figure in our nation's history, everyone should know more about the man who had a dream. For example, did you know he got a "C" in public speaking in seminary school? That's right! The speaker behind what is probably one of the most famous speeches of all time was not a natural at public speaking. Maybe you should remember that the next time you aren't instantly successful at something you are interested in when you first try it. Practice makes perfect, even for a man who now has his own holiday. So in honor of Martin Luther King Jr. Day, here are five facts about MLK that you probably didn't know. 1. His birth name was not Martin. He was born Michael Luther King Jr. His father took a trip to Germany in 1934, where he was inspired by Protestant Reformation leader Martin Luther. King's father changed his name, as well as his five-year-old son's. 2. His "I Have a Dream" speech was partially improvised. The "dream" reference was not part of the original draft written with help from Clarence B. Jones. King was inspired to add it after singer Mahalia Jackson urged him to "speak about the dream." 3. MLK began attending college at age 15. I guess you'd have to be a supreme smarty to inspire a nation. King skipped ninth and 12th grade since he was such a gifted pupil, and enrolled at Morehouse College in 1944. 4. He was thrown in jail almost 30 times. Not all of the arrests were for legitimate reasons, as you can imagine. Like the time he was jailed for driving 30 mph in a 25 mph zone in 1956. I mean, come on. There were also arrests made for "acts of civil disobedience." But he didn't let any of that slow him down, because leaders, and heroes, always persevere. 5. His "I Have a Dream" Speech was almost never heard. A state-of-the-art sound system was installed for his speech, but was actually sabotaged right before the event began. Luckily, the Attorney General Robert Kennedy was able to enlist the help of the Army Corps of Engineers to fix it in time.